Sometimes in the evening you just do not feel like cooking. In that case, this simple recipe is of great use. 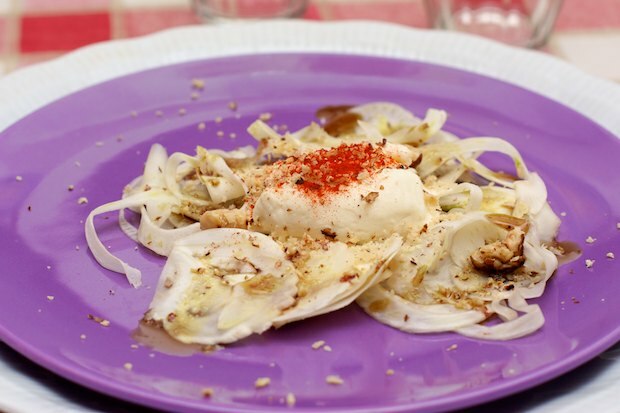 Just stop at the supermarket and buy some soft cheese or even sour cream (the cheese in my recipe is stracchino), a fennel bulb, hazelnuts, and some nuts, and you have a healthy dinner that is ready in no time. The portions are small, so if you are hungry, double the ingredients. This recipe is my personal creation. Cut the fennel into thin slices and place them onto four individual plates. Put a piece of cheese or a dollop of sour cream on top in the center and sprinkle with chopped hazelnuts. Sprinkle sweet paprika over the cheese or sour cream and serve. Posted in no category, Salads, Vegetables and tagged with Cheese with Fennel and Hazelnuts, Formaggio con Finocchi e Nocciole. RSS 2.0 feed.